Our food preferences and beliefs and our relationship with the foods we choose to eat are as personal as they are diverse. They form the backbone of the cultural traditions that root and shape us as well as the modern fads that propel us to experiment with new food trends. In traditional holistic healing traditions, nutrition is the foundation for wellness and its importance cannot be understated. 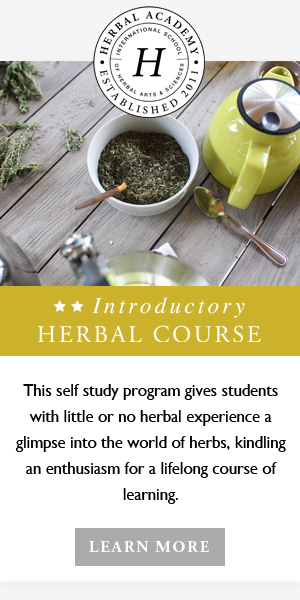 In Recipes from the Herbalist’s Kitchen, Massachusetts-based herbalist Brittany Wood Nickerson explores this concept in depth, focusing on the contributing role that food and herbs can play in our lifelong well-being. I would be remiss not to mention that this book is downright gorgeous! Stunning photos from the author’s farm, kitchen, and table are interspersed throughout her essays and recipes. A quick flip through Recipes from the Herbalist’s Kitchen might leave you with the impression that the book is primarily recipes, but there is actually so much information packed into every nook and cranny of this book—an inspiring introduction exploring our role as heroes in our own wellness stories, the role of the five tastes from an energetic and physiological perspective, a materia medica of culinary herbs, and instructions for making basic culinary herbal preparations. Short essays throughout explore seasonal eating, the importance of honoring our own constitutional individuality, and the many ways we can nourish ourselves (to name a few), all while evoking a sense of empowerment that puts the reins guiding our wellness right back into our own hands. With lush, beautiful writing and very practical, supportive wisdom, the author supports the journey into wellness through thoughtful preparation and enjoyment of good food made exceptional with herbs that complement and enhance the food’s qualities. The recipes themselves are appealing and rich with flavor without being fussy in terms of ingredients or preparation. I pored through the book to see what recipes jumped out at me for which I had the ingredients to make already in the house (and garden), and settled on the dill and cheddar crackers (a snack for the kids) and the roasted onions with sage butter (for dinner). After preparing and thoroughly enjoying both, I proceeded to make our weekly grocery list using several recipes as my guide—the hot and sour soup seemed like an absolute must, as well as the lavender fizz, cilantro lemonade, and deep-sea purple kraut. The baked eggs with parsley pesto are the perfect way to use the copious eggs from my flock of chickens and give the kids a tasty breakfast to start their day off right. And Positive Life Lessons, Too! “What’s the big deal with stems? Cilantro, parsley, kale, chard, spinach…so often we are told to remove the stems from our greens, but the stems have the same nutrition as the leaves. We want things to be so neat and tidy all the time—in our home, in our job, in our relationships, in our food—but life is a mess! Dirty, tough, painful, sad, and lonely and full of joy, wonder, beauty, amazement, and passion. These experiences do not have to be separate, but we often separate them like a leaf from a stem, thinking we can have one part without the other. But can you experience joy and beauty and wonder to the same capacity without pain and sorrow and loss? Can you enjoy the clean and simple without an understanding of the dirty and messy? I say, keep the flexible stems: let them hold the center, sway and adapt, nourish you, and challenge your sense of neat and tidy. May their presence make the texture richer, truer, and more nuanced” (Nickerson, 2017, p. 169). I remember preparing dinner with an adult family friend when I was about nine years old. We were cutting tomatoes, and she just sliced the whole thing up without coring out the stem attachment as we had always done. I was slightly aghast, and she just laughed and said, “What’s the big deal? You know you can eat that, too.” As soon as she turned her back I took the slice from the stem end and tasted it myself, then proceeded to eat the same from each tomato I sliced. I was liberated! Growing up on a farm it wasn’t like I was experiencing an overly clean and tidy existence, but the idea that I could just eat the whole tomato, brown patch and all, was a little rearrangement of my bag full of preconceived notions. I feel like this book does this in its own way—rearranging our ideas of what using herbs for wellness really means. While it can mean elderberry syrup at the first sniffle or turmeric supplements for inflammatory joint pain, it can also be cilantro pesto smeared on a piece of crusty bread, or fresh garden vegetable ratatouille chock full of Mediterranean herbs and garlic. It can be warm, hearty soups in fall and winter, sauteed dandelion greens in spring, and crisp cooling salads in summer. It can be the process of growing and harvesting our own herbs and vegetables (or visiting the farmer’s market) and then taking the time to make meal preparation part of the rhythm of our lives. Herbalism is as much a process as a practice. Messy and imperfect, personal and exactly what we need, because we tailor it to ourselves. And ultimately, beautiful, joyous, and empowering. Recipes from the Herbalist’s Kitchen is a lovely guide for inspiration and practical approaches to incorporating herbs into daily meals. I for one will be placing it front and center on my cookbook shelf and turning to it again and again! Want to win a FREE copy of Recipes from the Herbalist’s Kitchen by Brittany Wood Nickerson? We’re hosting a giveaway over on our Instagram page August 4th to August 7th at noon EST. Come on over and enter for a chance to win!